It was about 1930 when my parents moved from Soho, where I was born, to newly-built 144 Middleton Road in the small cul-de-sac opposite Muchelney Road. Our family consisted of my parents, an older sister, me and a younger sister. It was a two-bedroomed house and after some years there, just after the start of the war, we moved to a bigger three-bedroomed house on the west side of St Helier Avenue, probably near Cartmel Gardens. We lived there through the Battle of Britain and well into the night bombing period. 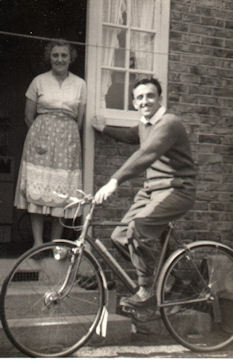 In 1941 my mother moved her family north to Lincolnshire and we stayed there for the rest of the war. 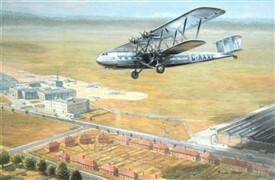 Afterwards she returned to London and my parents finished their days on the new LCC Roehampton Estate. My first conscious memories are of the St Helier Estate, a vast mass of houses stretching, seemingly, for miles in all directions. The houses were all much the same: brick (red or yellow), red tiled roofs, white painted sash windows with small panes of glass. The front doors had frosted glass panes above a brass door knocker and letterbox. Each had a small front garden with a privet hedge, each had a back garden. But my particular memories are of the cul-de-sac and the house we lived in. There were, at the entrance to the cul-de-sac, a terrace of four houses on the left, a similar terrace to the right and a block of four houses across the end. (I could still name most of the folk who lived there.) Two were occupied by older ladies, one alone and the other with grown-up daughters. But all the rest were families with children, about 20 in total. 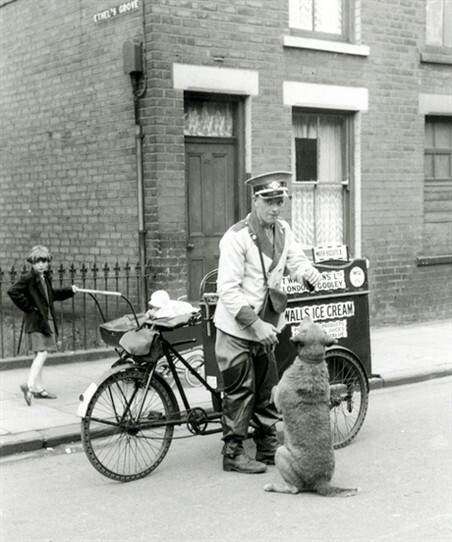 The fathers all went off to work in the morning: a printer, a dustman a train driver, an electrician (my dad), a city worker in bowler hat, a man in a bank, a bus conductor and a bus driver. No women worked in those days. Our house was the last one in the right hand terrace. Being in a corner, it had a bigger garden than most with a wooden side gate to the garden. The ‘front door’ was at the side and opened onto a tiny hall. Straight on was the living room at the front of the house. It had a cast iron fireplace with a pair of trivets, which swung across the fire to heat saucepans or kettles. Around the fire was a curb with a box at each end used as a seat; the seats lifted on hinges to uncover storage space, old newspapers and wood for fire lighting. You could stand on the seats to reach the mantelpiece. I slipped off one day and caught my head on the trivet, after which we only had the one trivet. I still have a faint scar on my forehead. In the middle was a table with turned legs and over that a red velvet cloth hanging low down with a fringe; underneath was a good place to hide and play out of other people’s way. There were two armchairs and a settee, covered in brocade that had once been colourful but in my memory was almost black. On the mantel piece were the clock (a wedding present, a nice one with Roman numbers, exchanged when it stopped working for a cheap chiming clock), Uncle George’s photo in uniform (he was killed in the war) and a couple of vases in which were put buttons and pins and things. Decorating the walls were two watercolours of fishing boats at sea (painted by one of Dad’s brothers). 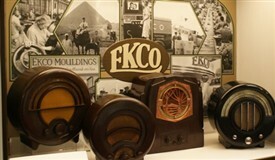 Later on we had a radio, an Ekco made of brown Bakelite and now regarded as a design icon of the period. Adjoining this room was the kitchen with a door to the bathroom and the ‘back door’ to the garden. It contained a central kitchen table with drawers that held the knives and forks; its top was plain scrubbed wood. There was a gas stove and sink with a wooden draining board and a mangle that closed up to make a small table top. Off the kitchen was the larder where, also, were kept the plates. We ate in the kitchen. The bath had a single cold tap. The hot water was obtained from the ‘copper’. This was a large vat, made I suppose of copper, with a small place for a coal fire beneath. It was covered with a heavy wooden lid, which would have made a good toy shield but that wasn’t allowed. The copper was filled using saucepans and emptied the same way. We bathed once a week, one child after the other. On Mondays the washing was boiled in the copper and rinsed in the bath, with blue bags for the whites. Then it went in a galvanised bath to the kitchen where it was put through the mangle. From the hall, the stairs ran straight up to the facing toilet. The big front bedroom was Mum and Dad’s, double bed with solid wooden ends, a dressing table with oval mirror and a wardrobe, both in a reddish coloured wood. Over the stairs was a large built-in cupboard big enough to hide in. They had a framed picture with an oval gold mount of three young children, naked, kneeling on a rock looking down into a stream. I have never seen anything like it since. We three children slept in the back bedroom in iron beds; they all, more or less, had knobs and bits that unscrewed. It must have been crowded as, by 1938, I was ten and Audrey fourteen. Our walls had two small pictures edged with passe-partout: ‘Echo and Narcissus’ and ‘Hope’, sitting precariously on a steeple, blindfolded and playing a harp. The back garden was split in two. Behind the house was the flower part and to the left were the vegetables. I can remember trellis near the house with a small pink climbing rose; beneath, every year, grew masses of Nasturtiums. Elsewhere were what I now recognise as Antirrhinums, Heleniums and Japanese Anemones. At the start of the war everyone had an air raid shelter erected in their garden by council workmen. They dug a big hole in the vegetable garden, about five feet by eight and three feet deep. The soil was solid clay and the moment it rained the hole filled with water, and so it remained until we moved to St Helier Avenue. Although I am now so interested in natural history, I don’t remember any birds that visited us. A ‘brown’ butterfly was a rare event. There weren’t any cats that I recall. Few people kept dogs. Things I do remember seeing from the garden were aeroplanes going to and from Croydon, big passenger biplanes, and once a Zeppelin. For its day, the estate was well laid out. At the entrance to our cul-de-sac there were shrubberies behind three-strand wire fences, a favourite place for hiding. Across Middleton Road was a large green (Moreton Green) with a bit of woodland fenced off by high pointed railings, a place for ball games and more hide-and-seek; when I last saw it, the wood had gone, destroyed by generations of rough boys and, finally, Dutch elm disease. Scattered about the estate were schools, all in a similar, vaguely Georgian architectural style. Ours was a few hundred yards away, Malmesbury Road No.4 School, infants and juniors, a big asphalt playground and a field behind. The seniors were on the other side of the field. Most shopping was done at Morden near the underground station or at Rosehill, two streets of shops. There were small rows of shops here and there. On St Helier Avenue was a row containing a bicycle and toy shop (where you could save a penny a week on a card to buy expensive Christmas presents like a 4/11 Hornby train set), a gents hairdresser (where I had my first haircut, kneeling in the men’s chair while the waiting customers were all laughing at my tearful face) and a newsagent and tobacconist (where Dad got a paper on his daily walk to the Station and was given a cigar as a present at Christmas). The other important part of our world was the park. There were several recreation grounds scattered about, flat play areas with football pitches and a few swings and roundabouts, but there was only one park. 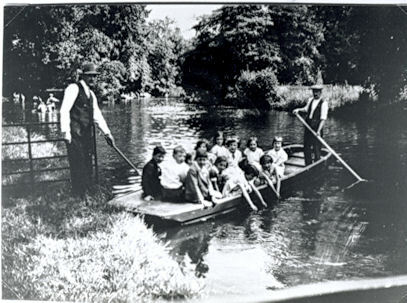 This was Ravensbury Park through which ran the Wandle. There were swans and ducks, sticklebacks and tadpoles, bushes to play cowboys and Indians, trees to climb and conker trees to throw sticks at - and park keepers to avoid. We made rare expeditions outside our world, fishing trips to Beddington Common, the fair on Mitcham Common, Saturday morning cinema club at Sutton, but our world was the estate. This page was added by Ken Whiteman on 05/05/2015.